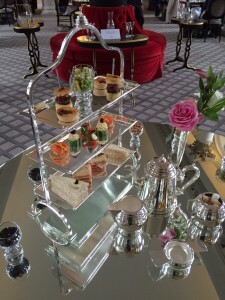 The Colonnades at the Signet Library serves a FULL gluten free afternoon tea – and I can tell you that it is really very good. The location is beautiful and the service good. If you are looking for something that is an experience, then this is the one to go for. I recently revisited the Colonnades in the gorgeous Signet Library at the very kind invitation of a visiting American who had read about Edinburgh on the GFE site. So it was a great opportunity to see if the gluten free afternoon tea still stacks up as it did when the Colonnades opened a couple of years ago. At that time I was emphatic that it was the best in town. The historic and beautiful surroundings are still there, the bespoke teapots still sparkle on the mirrored table and the food still arrives with a flourish. The welcome is possibly a little more low key than it was before and I had to ask three times on arrival for a glass of water, but there is no doubt the Colonnades is still something special. Our amuse bouche of tomato and basil soup was tasty and kicked things off nicely. The first, savoury, range of treats arrived. One thing the Colonnades aims to do is make the GF experience very similar to the “normal” one. Our stand looked beautiful, with sandwiches, quiches and pots of tiny treats. The pea mousse was delightful, with pea shoots curling out of the top – it was an example of what the Colonnades has always done wonderfully. However, the big change I noticed immediately is that the chef is no longer making the GF pastry cases. Before, they used Genius pastry, but now there are those bought-in tough and rather geometric GF cases which have the taste and consistency of a rather tough, dry biscuit (yes, you will have encountered these before). This is disappointing and I believe this is not how operators, Heritage Portfolio, do things. These little cases appeared 2 to 3 times on the savoury and sweet selection, so we took our teaspoons and ate out of them as though they were bowls; leaving the dried out husks of the sad GF world uneaten. The contents were delicious and would have thrilled anyone. The items that were already GF, such as mouthwatering macarons, little squares of polenta and balls of brie and tomato, were just perfect and gorgeous, but I think it has all lost the creativity for which it was known. I skipped the Genius bread sandwiches, sneaking the contents out and avoiding the bread. Again, I think there is better food out there – and particularly at £30+ a head. 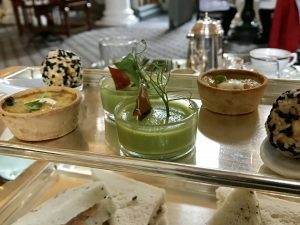 If you are looking for a gorgeous gluten free afternoon tea in Edinburgh this will not disappoint (unless you go on the back of my previous review – which I have now removed in the spirit of honesty and keeping up to date). The champagne is gorgeous and the surroundings are lovely and it is a special occasion made better by the attentive service. However, there are other choices and if you want to consider another option, click here for a list of others worth trying. We are certainly not short of choice!